Most digital photography businesses tend to grow from a kernel of interest in photography to an enthusiasm to a pursuit of the technical knowledge to a confidence that one’s skills and products can compete in the marketplace. This is often where the budding photographer confronts his or her first real challenge: you may be able to deliver the goods, but are you prepared to operate a business, regardless of what kind? Providing the service is the easy part (if you know your craft as you think you do); managing schedules, money, clients and maybe assistants requires an entirely different set of skills. A primary advantage of starting a photography business, compared to a restaurant, drycleaners or auto parts franchise, for example, can make this first challenge much smaller because you can start very small, part-time, only on weekends. You have a tremendous amount of flexibility in terms of the size of a photography business operations, while owning a restaurant or other retail establishment requires plenty of capital and a full-time/overtime commitment. Nearly all of the initial capital of a photography business is equipment. Without professional-grade cameras, lenses, lighting, etc., you’re already at a disadvantage. Other costs will depend on what kind of photography services/products you want to market. 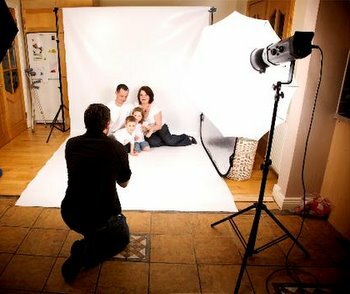 Portraits generally require a studio or the equipment to create a studio setting in a person’s home or office. Offer wedding photography services and you’ll probably need to invest in some appropriate clothing. Shoot sports, action and/or nature and you may need a different kind of wardrobe and other equipment for travel, or hiking through the backcountry. You may also need to add equipment to your computer/editing system, such as a bigger monitor, software and other editing tools. All these various components and thoughts about starting a photography business should be gathered and documented in a business plan. There are many business plan aids and examples available to help you write your own. At the level of a starter photography business, a business plan doesn’t need to be elaborate and lengthy, but a few sections of accurate, thorough and concise information. The first section explains why you want to start the business, what kind photography products/services you’ll offer, why you think those are the right ones, etc. The second section is your marketing plan, in as much detail as possible, including schedules and costs. The third section is an accounting of the equipment you must buy and overhead projections. Once you develop those projections, add 20% because you know they will cost more than you estimate. Then, balance those debits against your best estimates of the revenue/income you can generate during the first month, first six months, first year, second year, first five years, etc. Conversely, you should probably subtract 20% from these projections, as a reality check. The fourth section could list your credentials, photography education, awards, testimonials from clients you’ve already served as a semi-pro, etc. Again, the Internet is filled with information about to organize and write a business plan. Yes, you want to shoot pictures all day and have people pay you for them; but the reality is business knowledge, well implemented, will always be more important to your success. You don’t need a masters in business administration from Harvard or any other business degree. There are a myriad of resources to help you develop an entrepreneur’s mindset, learn the marketing strategies and tactics that have proven to work, customer retention techniques and long list of other skills that even the smallest business owner should know and use. You can find them on the Internet; in the thousands of business books, CDs, DVDs and seminars; local colleges; local business development groups; and the U.S. Small Business Administration. No doubt, your family and friends will cheer your entrepreneurial spirit and be your biggest promoters, even customers. Maybe more important to your long-term success is to gather a team of professionals because you can’t run even the smallest business totally alone. These include a mentor who could be a successful small business owner of any type or a local photographer that doesn’t mind creating competition; maybe he or she is ready to retire. Select an attorney and an accountant. Ask your insurance agent about any business insurance you should have. Find a reliable photo assistant you can pay by the hour or day, if you need him or her. If you follow these preparatory steps (and any others your success team may recommend), then you’ll be able to concentrate on finding clients and shooting photos from the very first day.